Quite simply, Yosemite National Park covers some of the most spectacular countryside in the USA and is well worth including in any California fly-drive itinerary. 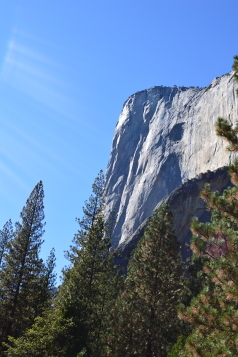 Soaring granite peaks, wildflower meadows, thunderous waterfalls and the mighty El Capitan and Half Dome topping it all off - expect dizzying heights and spectacular views at every turn. Yosemite Valley is the heart of the park with stunning views without even getting out of your car. Yosemite Falls is North America’s highest, and trails criss-cross the area. There are accommodation options here, or in other areas of the park - more affordable hotels are found just outside the park, in locations such as Oakhurst. Summer can get busy in Yosemite Valley and the snow in winter closes some roads (including the Tiogo Pass, the only east-west route through the park), so time your visit carefully - for us, spring and autumn are the best times. Keep an eye on road closures from October to May/June. Mammoth Lakes is an hour beyond Yosemite, and offers skiing in the winter and fabulous hiking in the summer. It’s also a great spot for an overnight stay on the route between Yosemite and Las Vegas. The Yosemite Gateway Inn is a contemporary-styled hotel just 15 miles from the south entrance of Yosemite National Park. Nestled in a tranquil hillside setting among tall oak trees, the hotel is a peaceful getaway retreat. Start in vibrant San Francisco before collecting a car and driving to stunning Yosemite national Park. Continue to Death Valley and finish your USA fly-drive in Las Vegas. Best from April to September. A superb California fly-drive itinerary taking in the California Coast from Los Angeles to San Francisco, along with Yosemite National Park and Death Valley, finishing in Las Vegas.